We are only in Week 2 on the farm and there are already injuries and corresponding transactions galore. The big league Cubs saw injuries from Victor Caratini and Mike Montgomery and a demotion of Carl Edwards Jr. to Triple-A Iowa which meant that the trio of Kyle Ryan, Allen Webster, and Taylor Davis got the call to Chicago. That forced a cascade of other moves, including Erick Castillo moving up from Tennessee to Iowa to be the backup catcher. Trevor Clifton found his way to the Iowa mound after being stretched out in Extended Spring Training and Vimael Machin was called up to Iowa to replace the injured Zack Short. 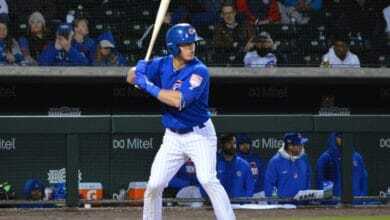 The other big promotion was Christopher Morel being added to the South Bend Cubs roster from Extended Spring Training. Morel is a lanky infielder and somebody to definitely watch moving forward this season. Besides the transactions, it is already starting to become very clear what this system is all about this year. There have been plenty of strong pitching performances, especially in Tennessee, but the bats have been ice cold just about everywhere you look. The I-Cubs wrapped up the second week of the season with a record of 4-2 after splitting their weather-shortened series with the New Orleans Babycakes and picking up a win in their series finale with the Nashville Sounds. They wrap up a series with the Oklahoma City Dodgers on Monday after going 2-1 so far. They will then travel back down to New Orleans for another matchup with the Babycakes before matching up yet again with the Dodgers going into next weekend. The Iowa bats were headlined by none other than Dixon Machado. Picked up the day before Opening Night, Machado has done nothing but fill up the stat sheet ever since. He was especially hot this week, slashing an absurd .400/.647/.700/1.347. He was walked in 41.2% of his plate appearances and added a walk-off home run on Thursday for good measure. Trent Giambrone came into the year as second fiddle behind Zack Short in terms of hype, but he has been leading the charge so far on the field. This week he slugged three homers and two doubles in his 24 at-bats, good for a .292 batting average. Ian Happ has gotten off to a pretty slow start this season and this past week didn’t really help matters. He slashed .227/.292/.364/.655 and struck out in 25% of his plate appearances. On the bright side, he was able to drive the ball into the gaps with three doubles since Monday night. Colin Rea looked great in his first start in front of the Des Moines crowd as he went a solid 6 innings, allowing no earned runs on 5 hits. He struck out 5 with 3 walks. Brian Duensing is still in the system after passing through waivers and being assigned to Triple-A before the season started. He looked like a major league talent this week, throwing 3.2 innings and only allowing a single hit and a single walk while striking out 3 batters. Iowa is quickly becoming one of the best teams to watch in the system just because of their mix of veteran players and top prospects. They might also be the most complete team in the system. The Smokies played all of their games this week against the Birmingham Barons due to their Monday matchup with the Mississippi Braves being cancelled because of the weather. They went 3-2 on the week and look ahead to a five-gamer with the Jackson Generals in Kodak followed by a double-header on Saturday versus the Chattanooga Lookouts. Tyson Miller went 5 innings, giving up no runs on 1 hit. He struck out 6 and walked one. Thomas Hatch went 5 innings, giving up no runs on no hits. He struck out 4 and walked one. Cory Abbott went 5.2 innings, giving up 1 run on 8 hits. He struck out 8 and walked one. Excluding a fill-in start by Brad Markey on Sunday, the Tennessee starting rotation now has a season stat line of 35.1 innings pitched, 18 hits, 3 earned runs, 39 strikeouts, and 8 walks. Pure insanity. On the other side of the ball, PJ Higgins has been the man. He did not get his first start at catcher until late this week as he has been playing a lot at first and third, even though catcher is still his primary position. He put together a .444/.524/.833/1.357 slash line in 18 at-bats while clubbing out two homers and adding a double and 5 RBI. Clayton Daniel made his way on to the Tennessee roster as part of the promotion commotion and has started each of the three games he has been present for. Since Thursday, he has 5 hits in his 11 at-bats. The Pelicans continued their rough start with a 1-6 mark this past week. They dropped all three meetings with the Down East Wood Ducks before managing to take one from the Fayetteville Woodpeckers out of the four-game weekend series. Those results go hand-in-hand with rough numbers in the individual stat columns, too. Because of that, there have not been as many notable performances coming out of TicketReturn.Com Field as there have been elsewhere on the farm. Aramis Ademan had an absolutely brutal start to his second go-round at the High-A level, but completely flipped the script over the last few days of this week. Starting Monday, he walked more (6) than he struck out (5), he tripled, hit a go-ahead home run, and put up an OPS of 1.012 in 26 plate appearances. Paul Richan looked good in his start this week, going 5 innings while only giving up a run on 3 hits. He walked 3 men and only struck out 2, but he sure did look the part. He was aided by defensive gems by Kevonte Mitchell in left field and Ademan at shortstop, but each of his three walks were on pitches right on the edges of the zone. Tyler Peyton turned a bad week into an almost perfect one. He was used as a piggyback reliever on Friday for Richan and went 3 innings while facing the minimum. He only allowed 1 hit and struck out 4 along the way. South Bend took home a .500 record this week, splitting their two series. They went 2-2 against the Great Lakes Loons during the week before going 1-1 in a weather-shortened series with the Lansing Lugnuts this week. They will stay at home for a three game set with the Loons before hitting the road to take on the Lake County Captains for three games to round out the weekend. The arms on the mound were stellar this week, highlighted by arguably the best pitching prospect the system has to offer. Brailyn Marquez made his season debut on Tuesday and, although he was limited by a pitch count as he gets stretched out, he looked terrific in his 3.2 innings. He struck out 7 of the 15 batters he faced and only gave up a single hit. He hung around the zone and featured a fastball that was sitting around 98 mph. Riley Thompson was an intriguing arm coming into 2019 and he has looked incredible so far this season. He went 5 innings in his start this week and only gave up 4 hits. He did not give up any runs and had a 5:1 strikeout to walk ratio. Not to be outdone, Cam Sanders also made his second start and he went 5 innings of one-hit ball, striking out three men in the process while walking four. The bullpen arms of Jeff Passantino, Riley McCauley, and Zach Mort looked terrific as well. They combined for 15 innings on the mound and only gave up 2 runs on 8 hits while striking out 14 and walking 4 batters. I have to throw in a mention for my favorite Cubs prospect. DJ Artis looked terrific at the plate en route to a .300/.462/.450/.912 line this week. Christopher Morel will be the guy to watch moving forward. He tripled in his first game up in South Bend and the 19-year-old will find himself in the starting lineup more days than not the rest of the season.